We serve Jackson, Nashville, Clarksville, Bowling Green, Murfreesboro, Owensboro, Utica, Fayetteville, Marion, Philpot, Mcminnville, Franklin, Leitchfield, Shelbyville, Hartford, Antioch, Paducah and many nearby areas in Tennessee and Kentucky. At Frontier Basement Systems, we provide solutions for repairing concrete slab floors that include a 25-year warranty against manufacturing defects, and a performance warranty from us. We offer free, no-obligation slab repair quotes within our service area. To schedule your appointment, call or e-mail us today! 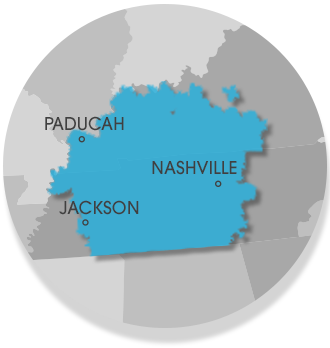 We proudly serve Jackson, Nashville, Clarksville, and many other parts of TN and KY.